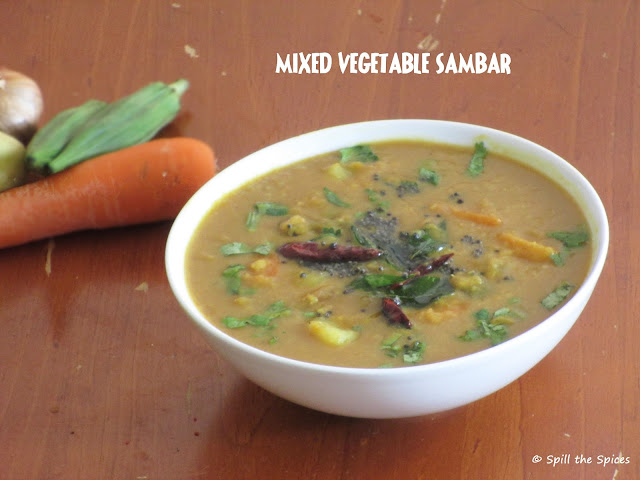 Sambar is a staple food in South India. Each of the South Indian states have a different way of preparing sambar. It can be made with a wide variety of vegetables. Most commonly used vegetables are small onion, drumstick, pumpkin, brinjal, radish, ladiesfinger, tomato, potato, carrot and capsicum. You can make with just one vegetable or a combination of any of the above vegetables. 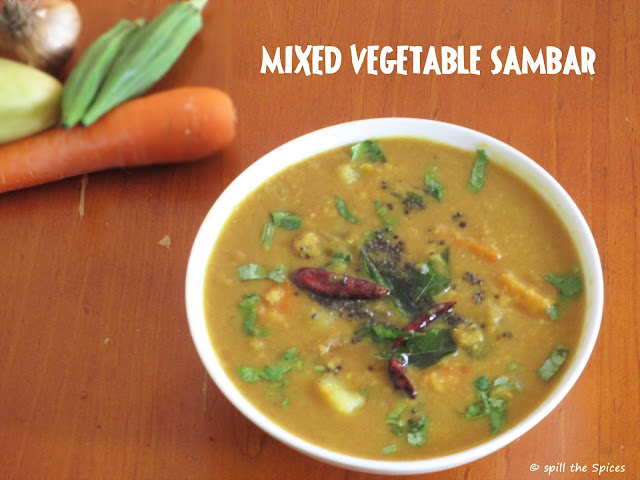 Sambar is made in two ways. One is using sambar powder and other using freshly grounded coconut and spices. This sambar is prepared using sambar powder. Enjoy this piping hot sambar with a bowl of rice or with idli/dosa. 1. Wash and pressure cook the pigeon peas/toor dal with enough water and a pinch of turmeric powder. Mash and keep aside. 2. Soak the tamarind in 1½ cup water, extract the pulp and keep aside. 3. Heat 2 tsp oil. Add small onion, vendakka, carrot and fry till the onions become soft. 4. Add pumpkin, tamarind extract and bring to boil. Reduce the heat to medium and cook the vegetables in the tamarind extract till they are soft and tender. 5. Now add the potatoes, salt, sambar powder and mix well. Allow to boil for few minutes. 6. Add the mashed dal, combine and and cook for another 4 to 5 minutes. 7. Add red chilly powder and simmer for 1-2 minutes. Remove from heat. 8. Heat oil in a tadka pan and add mustard seeds, red chillies and asafoetida. When crackling, add curry leaves and pour into sambar. Garnish with coriander leaves. Serve hot with rice or idli/dosa. simple and yet a delicious all time fav. adding veges make it more delicious. Tasty sambhar!! Lovely snaps! I am your new follower. Do visit/folow my blog at - http://www.rita-bose-cooking.com. Nice click :) luv any version of sambar. 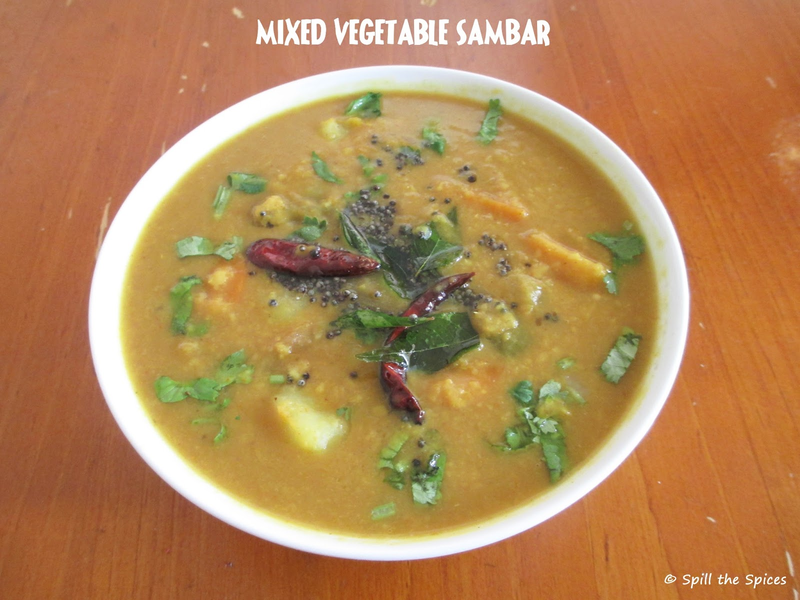 Mixed veggie sambar has a special taste from all the different veggies..